On Wednesday, May 11, there will be an inquiry by a work group in the U.K.’s Parliament into whether increases in the prescribing of antidepressants are fueling a marked increase in disability due to anxiety and depression in the U.K. I wrote about a similar rise in disability in the United States in Anatomy of an Epidemic, and the All Party Group for Prescribed Drug Dependence, which is the Parliamentary group that organized the debate, asked me to present the case against antidepressants. For me, the invitation to present to the work group provided a nice opportunity to update the case against antidepressants that I made in Anatomy of an Epidemic. The slides that I will present on Wednesday are attached here. The data, I believe, are stronger than ever. You see a correlation between rising antidepressant usage and rising disability rates in country after country, with mood disorders the primary culprit. 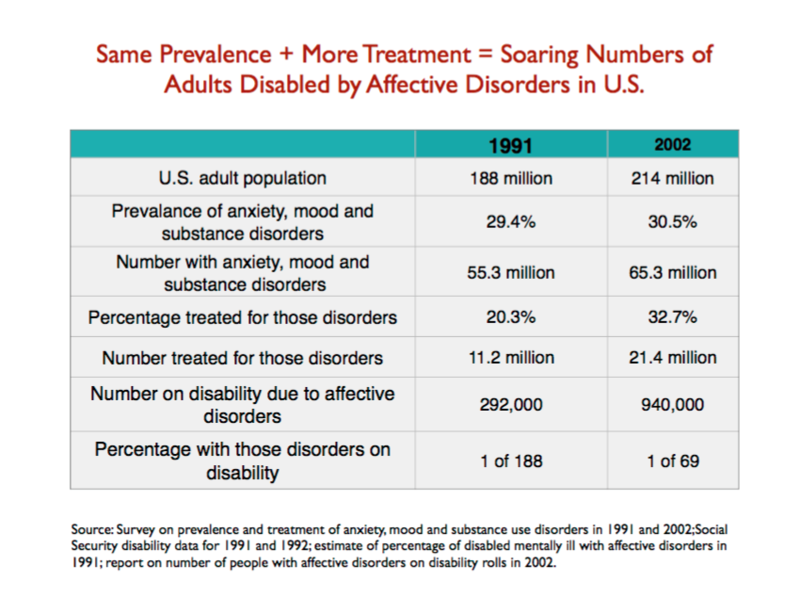 In the United States, for instance, the number of adults on disability due to mood disorders has risen from around 425,000 in 1994 to nearly 2.1 million in 2013. 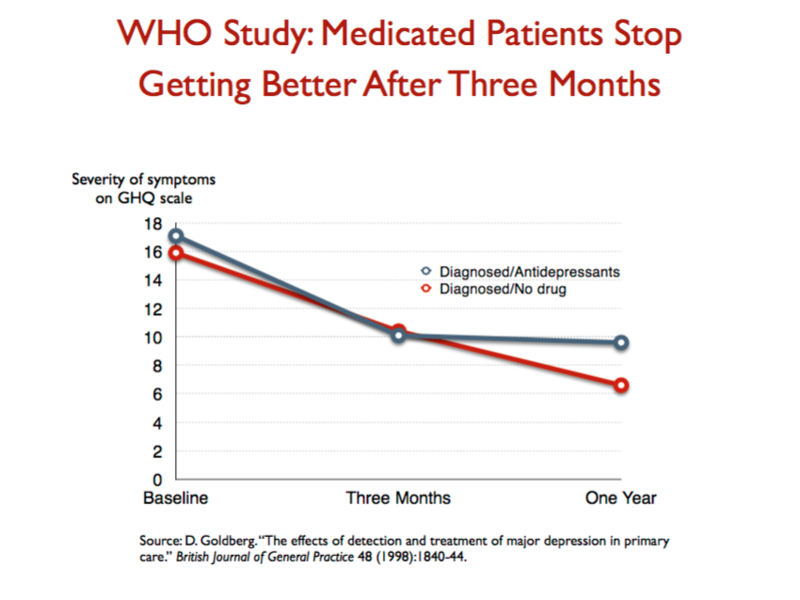 During this period, the percentage of the population taking an antidepressant quadrupled, from 2% to 8% (slide 3). In Anatomy, I wrote of evidence that antidepressants increase the chronicity of depression, and how they also increase the risk that a person with unipolar depression will have a manic episode and convert to bipolar. While doing this presentation for this Parliamentary session, I found some additional evidence of these two risks. First, there are a number of studies that show that depressed patients treated with antidepressants are roughly twice as likely to be depressed at the end of one year as those who don’t take the medications. And now look at slide 26: This WHO study captured the “Prozac Poop-out” factor. After three months, the medicated patients had a slightly greater reduction in their symptoms than the unmedicated group. But the medicated group stopped getting better at that point, whereas the unmedicated group continued to improve. The path to chronicity shows up in the time course of that study. At the meeting, after I make this “case against antidepressants,” there will be a brief talk by Paul Brett, who has lived experience of this type, and then there will be a panel discussion, which will be moderated by Peter Kinderman, president of the British Psychological Society. The panel members include Joanne Moncrieff, who has published papers on the rise of both antidepressants and of disability in the UK, and Sami Timimi, both of whom are known to MIA readers. Allan Young, chair of psychopharmacology for the Royal College of Psychiatrists, is expected to provide a rebuttal. The goal of the meeting is for the All Party Group for Prescribed Drug Dependence to set an agenda for investigating this public health concern in greater depth, and for crafting a response to it as well. I am interested in what Allan Young has to say. I have never heard anyone rebut the arguments on the dangers and ineffectiveness of anti-depressants with anything approaching scientific rigour. Would you be able to post the gist of his argument here? I would imagine Dr Allan Young will enthusiastically present some type of half baked waffle. What happened in my own case is exactly as you describe. Too bad I really AM disabled now, thanks to the iatrogenic damage caused by the drugs I was prescribed for my ‘chemical imbalance’. I’m disabled BECAUSE of the drugs. Good, Maybe the UK will listen. I am thinking about that kid I was with in the treatment center who they gave Wellbutrin sitting in the chair in from of the nurses station rocking back and forth in the chair all messed up from it complaining how it made him feel sick and “speeded out”. Forget about what happened to me, all I know is I wouldn’t participate in this website or any of this if I didn’t personally witness so much harm and so little good. The big thing now is opiate addiction but what the TV and newspapers don’t point out that most of these young people addicted were psych drug kids pushed onto Ritalin or maybe Paxil or what ever they were pushing at the time the school counselor diverted them into psychiatric treatment. I have heard so many stories from people in addiction recovery of psychiatry robbing childhoods . First they gave me this pill and that pill that made me feel wacked out, then they said I was bipolar… Heard that so many times. Yes, cat. It’s a natural drug progression to go from speed to heroin. 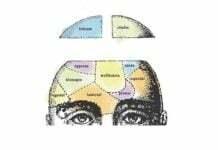 The speed gives you distorted perceptions (the notions you’re being spied upon, etc., are physiological), while the smack has antipsychotic properties in addition to being addictive. Nothing like a Roxy 30 to chill out after a long day on Vyvance. These efforts to treat a syndrome with numerous causes with antidepressants alone reminds me of the saying, “when the only tool you have is a hammer, everything begins to look like a nail.” In my mind’s eye, I see this multitude getting antidepressants inappropriately for an assortment of ailments, from metabolic to allergic, as their shrinks scold them for not recovering from their alleged imbalances in brain chemistry because they mustn’t be taking their medications..
Well done on this work, Robert. Will be interested to see how the debate plays out in terms of how much of it makes the news, what the content of any rebuttal is, and if it starts to affect policy. I hope the point will be made by some of the other panelists such as Timimi that the lack of valid diagnoses for use in prescribing these drugs is another serious, perhaps unfixable problem. And, almost NEVER does any psych patient get even simple blood tests, just to check on blood levels of the drugs they ARE taking…. How do the Docs know what dose does what, or if it’s “working” or not, in the absence of even BASIC BLOOD TESTS….????…. 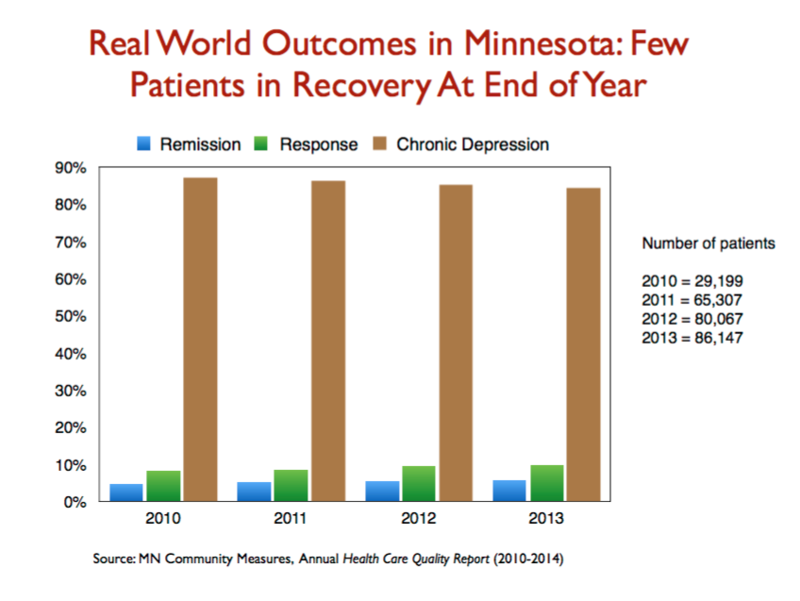 I went TOXIC on Trazodone, because the CMHC never even took a blood level…. And I had a history of alcoholism, and (mild) liver damage, which was an absolute indication to test…. But they never did, and I went toxic, and was hospitalized 2 weeks…. That happens to others far more often than the psychs will admit…. Robert, another point to consider is that it is not so simple as “Same Prevalence plus More Treatment” (equals more people “Disabled”). Additional factors that come to mind as driving rising disability in advanced economies include the following: 1) Western economies are increasingly being destabilized by the rise of automated/robot workers, 2) increasing offshoring of jobs from developed to developing nations, 3) increasing cutting of healthcare/retirement benefits in other parts of the economy, and 4) the gradually rising cost of fossil fuels (also can be understood as decreasing energetic return per unit of investment in fossil fuels/i.e lower EROEI). All of these factors are undercutting the ability of companies and governments to provide a true living wage, while driving global debt higher and higher. These factors together have made it harder to get and keep a good job. In a sense they have shoved vulnerable people in developed nations into disability programs, since it’s easier to survive on these programs than via paid work, which is harder and harder to find especially when one is suffering emotionally. I would even speculate whether these macroeconomic factors together are more important in the rise of disability rates than the increasing use of antidepressants. I don’t know that, but wouldn’t be surprised if it were true. On the other hand, my opinion of antidepressants based on reading Kirsch, Breggin, Moncrieff and others is still very low, and I’m pretty confident they contribute to rising disability too, given all their physical and psychological negative effects. Your arguments here are valid, and have some merit, “BPDTransformation, B.A.”…. **BUT**, it isn’t only “antidepressants”…. Today, the SSRI’s and SNRI’s have largely replaced the older “tricyclics” such as imipramine. 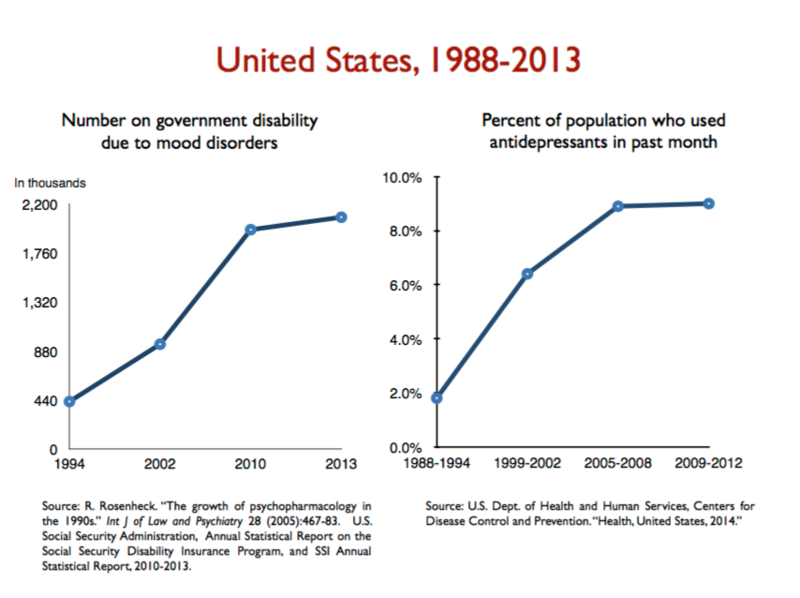 Regardless, it’s psych drugs of ALL KINDS that are driving up disability rates. And, you’re forgetting a crucial, VITAL factor which is keeping disability rates artificially LOW. That would be the medical community’s IATROGENIC DEATH RATE….. There would be more people living on disability, if modern medicine wasn’t KILLING them so fast….. Any of several reputable sources present various statistics, but *100,000* PER YEAR DEAD is a good average. It’s called PSYCHIATRIC.DRUG.GENOCIDE/……….. I agree with what you say. However, I think the research studied controls for that effectively, because it’s randomly selecting people from the whole population, all of whom are affected by the variables you mention. Those variable would explain a GENERAL rise in disability rates, but the one study directly compares disability rates after receiving “treatment” and finds clearly that that variable alone leads to a fairly dramatic increase. 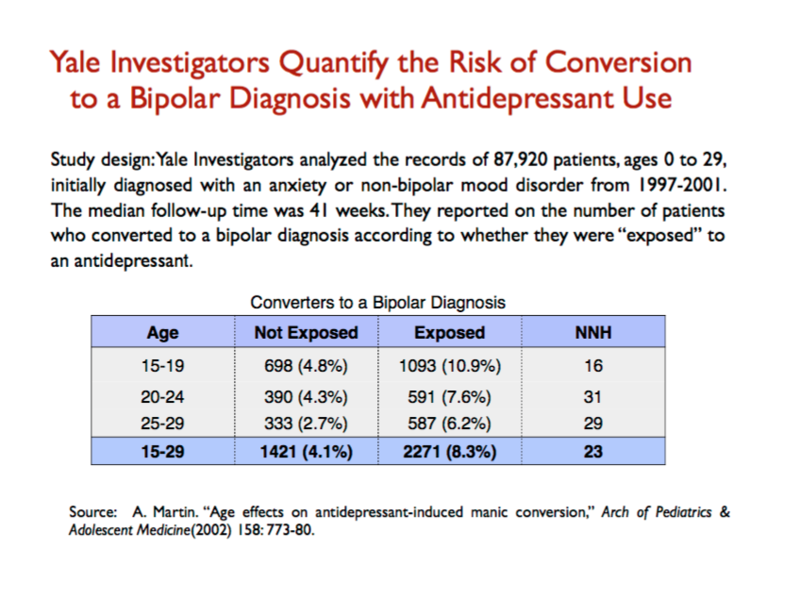 Also, the bipolar conversion rates, especially for kids, are quite dramatic, and further support that the increase we see in disability rates is likely due to adverse reactions to the drugs rather than or in addition to other social factors. MP Paul Flynn (81) referred to the ‘lack of depression’ when he was young – and a few people commented on this. At that time 500,000 British people were not disabled with depression – as they are today (I think the point was valid). Actually re my other reply, Paul himself referred to the history of dodgy medication attempts, back to Freud’s cocaine, so yeah I guess it’s just a point about the apparent numbers. I’m saying that it’s valid within the timeframe that is being measured, as all people in that timeframe are being similarly impacted by these macro variables. I agree that comparing, say, 1958 to 1995. Steve, perhaps I’m misunderstanding your comment, but I don’t understand how the research could control for macroeconomic changes in different time periods. People only live once / outcomes only get measured once at a particular given time… and thus the confounding factors of different economic environments at different times cannot be totally controlled for, is my opinion. Kudos, good luck, and thank you, Robert, and Luke Montagu, and James Davies. And I agree James’ book is a good ‘critical psychiatry’ one, and the only ‘critical psychiatry’ book I’ve ever found in a big box book store in the US, ever. And I am grateful for Luke’s connections, which helped to make this presentation to Parliament possible. Despite my American belief, that all people are created equal, and political connections are not what should be required to bring truth to light, especially in the so called sciences. Nonetheless, I’m grateful to you all, and best of luck, Robert. I do have faith that if you, Robert, can convince the English of the adverse effects of the psychiatric drugs, the American politicians will eventually also see the light. Since combining the antidepressants and antipsychotics is already medically known to create “psychosis,” via anticholinergic toxidrome. And these symptoms look exactly like the “common symptoms of schizophrenia” to the 15 minute med check psychiatrists of today. I do hope you keep us posted with how the debate goes. Best wishes, and thank you. Interesting. Good to hear Mr Whitaker is over here! Being a Londoner is the meeting open to a public audience at all? Where and what time anyway? Oh just realised an invite is linked from within the article! I consider my case of bipolar I to be unusual in that I don’t have mood swings. Seems contrary to the definition of bipolar. I did take Prozac for a year, due to complaining to a psychiatrist about insomnia, who diagnosed with with unipolar depression. I experienced the “poop-out” and quit after a year — I could tell it lost it’s effectiveness over time. Then I went a year without anything and was in good spirits. I attributed this to attending some personal growth seminars, which some people claim to cause mental problems also. I considered the seminars to be a natural anti depressant. Then I got married and stresses plus my trigger caused a first full blown manic episode. I blamed the seminars for a while. Then I just figured I must have been prone to developing bipolar all along, and that the depression diagnosis was a mis-diagnosis. But this data makes me wonder now if the Prozac may have been a factor in my becoming full blown manic. I have been full blown manic now three times, but in all three cases the same trigger caused the episode, so I just avoid that trigger and I haven’t had an episode since, which has been five years. I consider myself permanently slightly depressed, with no mood swings. Yet the diagnosis of bipolar I sticks with you forever. I am experiencing withdrawal symptoms from Abilify as we speak, my final psych drug. I will be med free from here on. Hopefully there will be some healing in my brain, and if the “permanently depressed” is a result of the psych drugs, that would be unfortunate, but again, perhaps healing is possible even from that. I wonder if there are other cases like mine from previous Prozac users who have become an odd case of bipolar in that they don’t have mood swings? 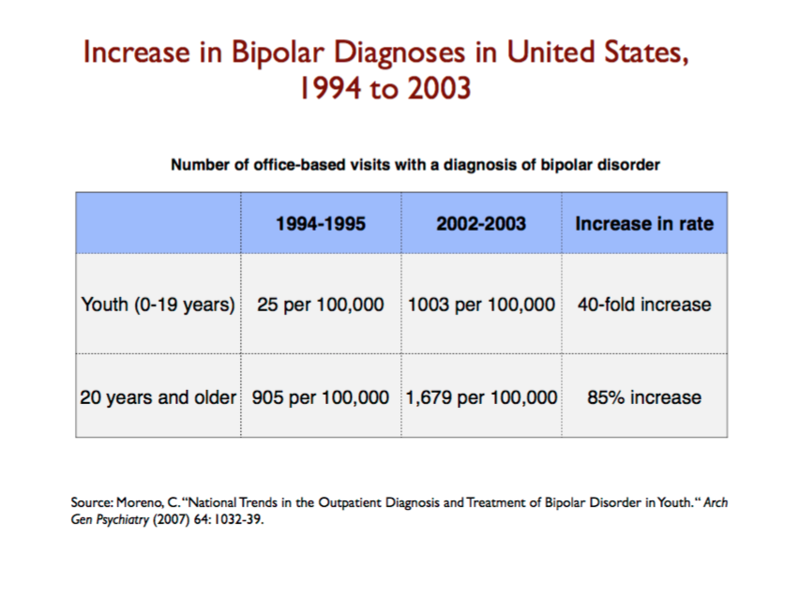 So-called “bipolar disorder” is an imaginary “disease”. It’s exactly as real as a present from Santa Claus. Who knows what that Jolly Old Elf is working on, in his workshop up there at the North Pole? I’m pointing out some scientific TRUTH, not making fun of you. I’m being 100% dead serious. The LIE about “depression” being caused by a “chemical imbalance” of the neurotransmitter serotonin, is 100% PR, and marketing hype. There is NO legitimate SCIENTIFIC evidence that either “depression”, or “mania” is caused by that imaginary “chemical imbalance”. Every time you go to sleep, your brain creates a natural narcotic, but that doesn’t make you an opiate, or Heroin addict. Isn’t “unipolar depression” simply “depression”? Is it “bipolar”, or “unipolar”? I’m saying your psychiatrist is engaged in an intricate word game with you. To sell you drugs. Because that’s what shrinks do. They sell drugs for the pharmaceutical industry. I’m not trying to diminish your distress, or negate your experience. Your “mental illness” has no objective reality. It only has subjective reality, the same as presents from Santa Claus. Please visit >beyondmeds.com<, and Dr. Kelly Brogan's site, for more information than I can go into here…. I wish you success in your efforts to taper off the Abilify. You might be surprised to learn that Abilify earns well over $1BILLION per year for Otsuka Pharm., and that Otsuka pays Docs. literally $100,000. 's per year in kickbacks. But they're euphemized as "consultancy fees"…. Yes, your brain and mind, and body CAN HEAL, RECOVER, and get BETTER than EVER. But YOU have to do the work! I believe you CAN!. You'll find lots of other supporting folks here on MiA. Welcome. Supporting folks on MIA ??? you are too far away and real support requires real $$$. This article of Roberts was written a year ago in 2016 and many others had questioned the use of these meds earlier BUT NOTHING HAPPENS FAST or effectively enough for those of us whom’s brain cells are atrifying……I even had read about how bad they were before I took my first pill but I was desperate enough I thought I would only be on them for a short time. ‘The cycle that captures’ and ensures huge profits for the drug companies is to increase the dose ‘until it works’ but by the time you realise it is not and will never work it’s too late. your body is addicted to something it does not want or need. I’m MAD/completely batshit crazy in Australia. Actually I’m not mad Im just addicted to first Effexor and now Pristiq. Tapering off only gets me so far then I give in.Going cold turkey made me lose the plot completely. I have to work to eat/live we all do. A part of me would love to curl up on the couch with a disability payment, get fat and eventually overdose on something quick and effective.I have been ‘hoping’ my depression would improve for 35 years. I constantly ask myself “Why bother”?. Am I going to live long enough to see the big Pharmas pay for the damage they have caused world wide the same way Hardy’s did? or get real physical assistance to get my creativity my passion for life back I doubt it! And if you find a respectable new doctor, and politely point out that claiming a person who does not suffer from mania and depression is “bipolar” is defamation of character, it is possible in time to get that misdiagnosis off your medical records. Since you’re weaning off your last antipsychotic, you should be forewarned that you may end up suffering from a drug withdrawal induced super sensitivity manic psychosis, and this can occur six months or even two years after you’ve stopped taking the drugs. And the medical community will claim this is a “return of your illness,” rather than a withdrawal symptom of the antipsychotics, if you end up hospitalized. Just want to give you a heads up, so you may educate your family, so they may help you in the event you do end up with a drug withdrawal induced manic psychosis. But, the good news is you can heal if you keep away from the medical community for awhile. Well, we’ll certainly be thinking of you today. This is awesome news! It sounds like a real debate, not the kind of “investigations” we get in the US congress where they only invite those who preach the party line. I find it encouraging to know that this kind of honest examination of data is going on at such a high level of government. I hope there is a plan to get this story to the media, especially if the committee recommends action to reduce long-term antidepressant prescriptions. It is a very exciting prospect! The evidence is fairly clear cut that that ‘normal’ people in the UK resorting to ‘medications’ are becoming psychiatric. About 10% of adults in the UK are now dependant on ‘antidepressants’. Sounds like the UK is “catching up” with us, sadly. But perhaps it’s been caught a little sooner – it certainly sounds like the question of whether this is working or not is much more “askable” in the UK than it is over here. Interesting the route this needed to take to make it to “high places”. Luc Montague’s connections were central to having this issue go to a “work group” in Parliament. If he had simply been an “ordinary” casualty of toxic psychiatric drug prescribing, his story would have disappeared without a ripple. My question is if indeed the mandate for CEPUK is to shine a light on the harms caused by psychiatric treatments, why there is nothing written about the harms of ECT and the total lack of an “evidence base” for its “use”. The only reference we see is in the video by Mary Maddock who speaks about her horrific experience with both ECT and psych drugging. My email inquiring about this big deafening silence on the topic of ECT- no statements by the high profile docs making comments about the problems with the drugs- was given the response that “we are limited in finances and resources and personnel” seems ridiculous. How long would it take to post a 3 minute video by one of the expert psychiatrists or current articles by Bentall and Read or others on this site? If this is the council for EVidence based psychiatry why is it not stating the evidence shows ECT is torture and causes brain damage? So, a bit off topic, but just really wondering if anyone has an answer for this one. The scary part is that the state created by the toxic drugging, horrific withdrawals, iatrogenic insanity, supposed “treatment resistance” as outcomes of the drugging invariably leads to “ECT as a ‘last resort'”. So, the two become enmeshed. I look forward to seeing the video on this discussion/debate on antidepressants and disability. This is so obvious to me as I taught for 31 years without a break, only to end up on disability after receiving “antidepressants” for situational anxiety and insomnia that spiralled into a bad reaction and poly toxic poisoning. And there was ECT brain injury waiting In the wings to ensure the disability was truly permanent. “truth”, I have a partial answer for you, as regards Electro-Cution Torture(“ECT”). Obviously, I don’t, and can’t, speak for CEPUK. As regards ECT, *sometimes*, it *seems* to “work” well, for *some* people. Usually, there’s a large, wealthy, dysfunctional family. “Aunty Betty”, or whoever, gets a little troublesome, or another Family member wants to steal the inheritance. Whatever. “Aunty Betty” gets taken to a shrink, dosed with tranquilizing drugs, gets some ECT, and VOILA!, Aunty Betty is now a smiling, drooling, compliant puppy-dog. She’s too brain-fried to resist, or make a fuss. You can take her out shopping, or for coffee. The rest of the time, she sits at home and drools. Sometimes, she *seems* to do OK on Social Security Disability. Families such as I’m describing here are usually active NAMI families. That’s the sad REALITY. 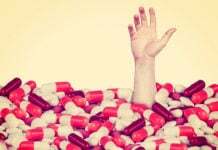 Drug zombies, and ECT victims are sometimes the desired outcome. Sick, huh?…. I want to get your thoughts. Often when applying for disability, people seek psychiatric medication because it substantiates the severity of their suffering. While these medications might in fact create more disability, there is also the possibility that people go on these medications to help promote a disability claim. The correspondence between disability and psychiatric medications (could in part) relate to this pattern. Also, if people are anxious about having their disability end, people will stay on medication (to emphasize that they are still disabled) and they will not show improvement. It will look like medications are not helping and leading to long-term disability, but the desire to retain disability is fostering the kinds of outcome data between psychiatric medication and disability reported in your article. Yes, Craig, the scenario you’re positing DOES occur, but it would be very difficult to tease out the specific numbers or cases. And, that begs a larger question of how it’s so easy to FOOL the doctors and other clinicians. But, anybody who *wants* to live on disability has a few screws loose anyway. I don’t want to live on disability, but I see no other viable option. I have been made unemployable. But remember, under the American ADA, a person is disabled if others consider them to be disabled. Therefore, disability really IS in the eye (and mind) of the beholder…. What a sick and twisted system you “doctors” and “businessmen” have created…. SSRI consumers are usually high achievers and not interested in a disability lifestyle; and when they mention their frightening ssri symptoms I believe them. I think the false ssri disability percentage is likely to be small. People who want to claim false disability are more likely to go for “stronger” drugs and to talk up their case in proportion. 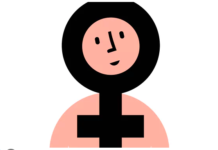 But there might be another anomaly – that being that the UK Medical culture might be over eager to promote Mental Health disability. I would say that at least 50 percent of UK Mental Health Spending is due to White Collar Fraud anyway. Most of the mentally disabled people I know are disabled due to ‘poor expectation’ bad advice; and ‘over medication’ bad treatment. Curious to know what came out of the meeting finally? Am not familiar with the Uk system so wondering how/where the debates lead to..